Great cocktails, quite a squeeze but maybe it was a busy night. It was open until about 2am last time I was there (a Thursday night just before Christmas). As for the toilets, just keep climbing! great place, totally unique for York. Top cocktails, fab food and friendly staff. And free WiFi to boot! fantastic bar, excellent cocktails, frendily staff, love it. Needs a sherpa guide when you go to the toilet though. Amazing. As soon as you walk into the bar, the atmosphere hits you like a cuban with a big set of rattling maracas, lol. The cocktails are great, they also sell Desperados and lime (one of the few places that do). Regular Latin dance nights are hosted here, it's a free-for-all and it gets packed to the roof with dancers. For any worried amateurs, the dancers don't care whether you're good or not, it's all about the atmosphere and they'll help you loosen up your hips. GREAT for a romantic date, the charm of the place will add to your own, how can you lose?? 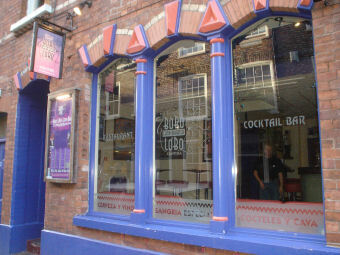 A very stylish Latin bar, in the centre of York city. Reasonable prices, great choice of spirits, cocktails and wines and most of all great South American food.